Bora Bora is a Polynesian Island that is located 143 miles northwest of Tahiti. Bora Bora is an island out of your dreams. If you could imagine what paradise is like, it would look something like the scenery you find around here. Perhaps this is why it’s so popular as a honeymoon destination. Many people go to Bora Bora for a romantic holiday away from it all. You will be stunned by its hilly peaks covered in rainforest, the clear blue sea and the luxurious huts that seem to be floating in the water. Some have called Bora Bora the most beautiful island in the world, and it's not hard to see why. 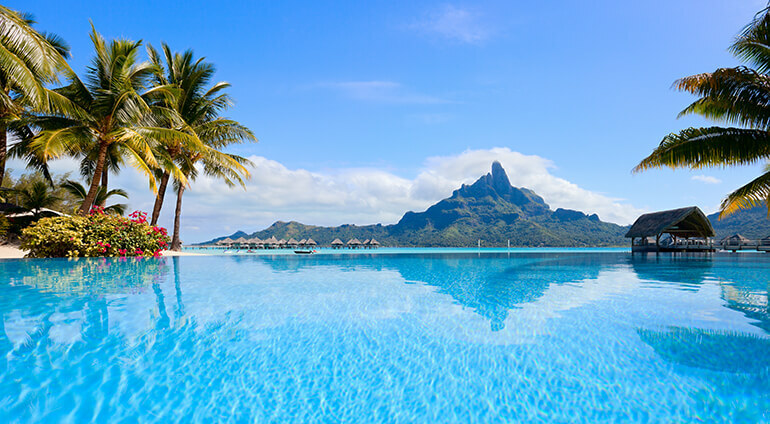 If you are looking for pure paradise and total relaxation then Bora Bora will tick all your boxes. The island also offers plenty of water sports for holidaymakers looking for an active break. The island isn’t a beach island, it’s known more for its piers and bungalows that sit beyond the shore on top of the water. Bora Bora has a warm tropical climate, soft white sand, idyllic scenery and gorgeous seas to snorkel in. Don’t miss out on the chance to experience pure luxury and mesmerising landscapes on this magical island.